Is it possible to create Thiessen polygons around nodes in QGIS? The ftools plugin can produce Thiessen polygons, as Vector -> Geometry Tools -> Delaunay Triangulation. Not the answer you're looking for? 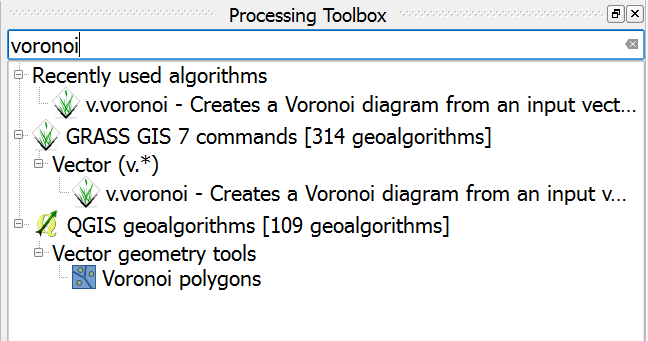 Browse other questions tagged qgis voronoi-thiessen or ask your own question. Converting point sets to polygon boundaries? Correlation between corn yield and planting speed using ArcGIS for Desktop or QGIS? How to draw boundaries to separate clusters? Creating Thiessen Polygons (Analysis) by defining external feature boundary?